If you submit benchmark pictures to the NGS photo database, their names must be in a specific format. This utility creates that format. The Edit menu in the DSWorld program has a similar feature, but my workflow makes this utility more convenient for me. If you use my 'Get GC Benchmark Logs' program you can Right click on a benchmark in GSAK, and click Edit -- the PID & Name are highlighted and ready to copy and paste into the upper right-hand box of this form. Otherwise use the separate PID and Name boxes on the upper left. The 'Direction' is the direction you were facing when you took the picture. The Date is the date you visited the mark. If you double click in this box it will automatically enter today's date. 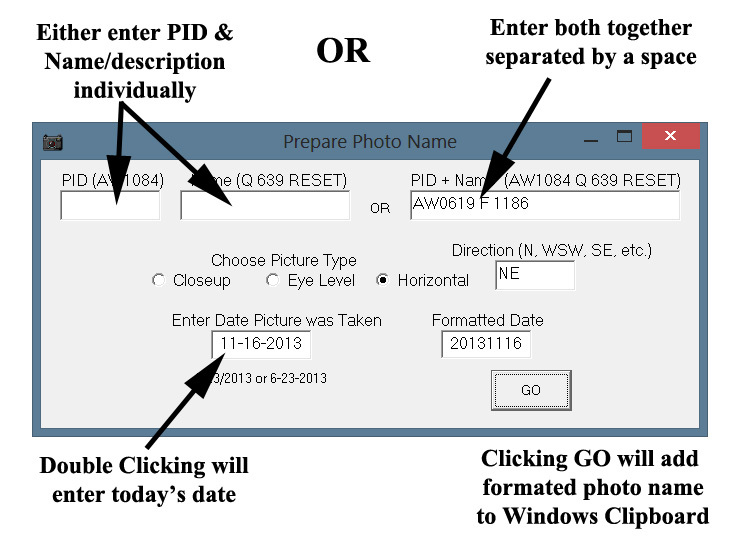 When you click OK the program will put the correctly formatted name onto your Windows Clipboard ready for pasting into the photo name. The picture types are probably clear but closeup shows the mark and it's identifying words and stampings. Eye level or standing is above the mark showing its immediate surrounds and setting. Horizontal is a wide view showing its location relative to nearby buildings, monuments, highways, towers, etc. I normally just use the Horizontal to create the picture filename, then edit the Closeup and Eyelevel picture characters to 1 & 2 respectively. If this isn't clear it will become so once you start using the program.